Since the 1980s, the JSW team has been specialising in production drilling and blasting, exploration drilling and grade control, successfully completing projects from large scale bulk iron ore and coal mining projects to mid-scale gold and lithium projects. Drawing on this experience and its solutions-focused approach, the company is solving industry challenges – from the development of unique drilling methods for some of Australia’s largest miners to the implementation of smart data capture and transfer systems to optimise drilling outcomes. JSW’s track record of investing in the latest technology and delivering project-specific solutions extends across more than 30 years. The company was the first Australian drilling contractor to purchase hydraulic powered crawler blasthole drills in 1981 and introduced large diameter blastholes for bulk waste drill and blast. It has continuously sought out drilling productivity improvements by investing in the latest technology drills and was the first drill and blast contractor to own and operate 120,000lb pull down rotary drills for hematite and magnetite iron ore mining. More recently the company has developed specialist small footprint high capacity RC drills to meet clients’ specific project requirements. Underpinning the company’s capability to innovate and evolve is one of the country’s largest fleets, a team of highly experienced and trained personnel, and best practice policies and business systems. JSW offers a full drilling service. Its flexible, highly productive rigs for drill and blast range from small diameter top hole hammer drill rigs to large diameter downhole hammer and rotary drill rigs. With the capability to drill holes ranging from 64mm to 311mm holes in diameter to a depth of 80m, fit-for-purpose solutions are available for any project requirement. For exploration drilling and grade control, JSW’s low footprint drill rigs eliminate the time to build pads while reducing environmental impact. 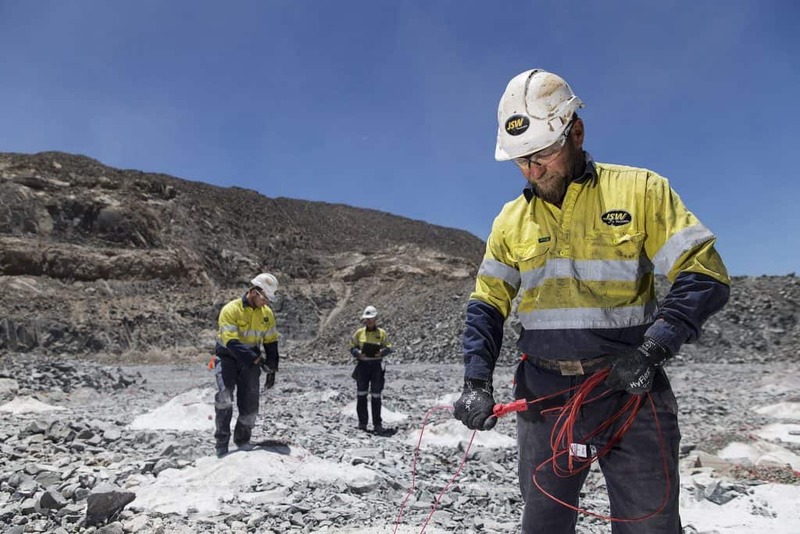 With trained maintenance crews and state-of-the-art workshops in Perth and Kalgoorlie, JSW also has the ability to provide fleet maintenance support to both mine owner-operators and contractors. JSW’s pursuit of continuous improvement ensures it employs the best people, infrastructure and technology. Consistent performance is achieved through highly experienced personnel, including specialist engineers, and its systematic and collaborative approach to all projects. Custom-developed proprietary integrated business systems provide transparency and deliver fast and accurate drill and production data to clients. JSW is one of very few drilling contractors in Australia to be a Registered Training Organisation and leads the employment of indigenous Australians by actively engaging with JV partners and directly employing from local communities.